Today, 28 May, 2017 [ 14 Jesth, 2074 ], Council for Technical Education and Vocational Training [CTEVT] examination Controller Office, Sanothimi Bhaktapur publishes the examination routine of Special Chance Examination for Diploma and PCL. The examination will be held on Aashad 2074. The examination start date is 5th Aashad, 2074 and end date 16th Aashad, 2074. First Shift examination time starts from 7:00 AM and Second Shift examination time starts from 2:00 PM. 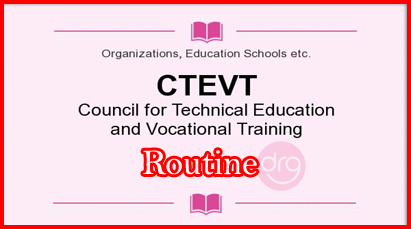 See the detailed information regarding the routine published by Council for Technical Education and Vocational Training [CTEVT]. Note: Click on above images for Clear View. 0 Response to "Routine for Diploma and PCL | CTEVT​​ | Special Chance Partial Examination"